Box has topped Gartner's magic quadrant as the analyst wizards cast their judgemental eyes over the content collaboration market. 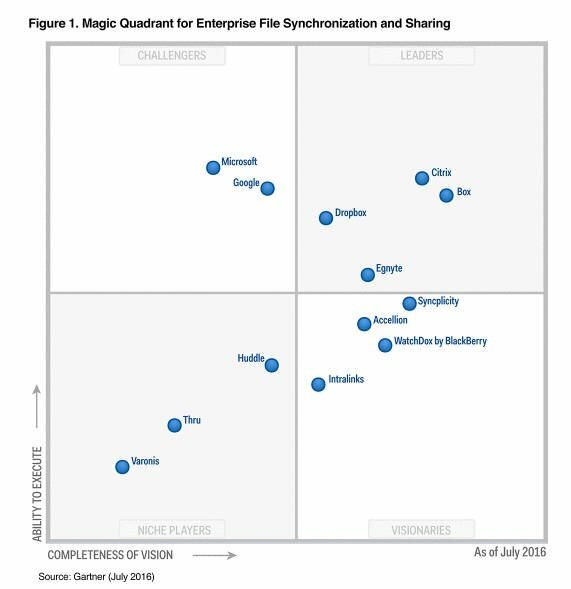 Enterprise file sync and share (EFSS) has grown up into the content collaboration market and Gartner has given it a kiss of recognition with its very own magic quadrant, continuing its EFSS magic quadrant sequence. But backup suppliers who don't have separate content collab platform products (CPP) like Acronis, Driva, Commvault and Intermedia don't get a look in. Nor do Barracuda Networks, CA Technologies, Nasuni, Oracle and others. Thirteen CPP suppliers have been distributed across Gartner's classic diagram. The most populous quadrant is the leaders box (highest ability to execute and completeness of vision), with Box top and Microsoft, Dropbox, Citrix and Google clustered fairly closely together. Below them are Axway (Syncplicity) and Egnyte. There are no challengers (high ability to execute, low vision completeness) and only two visionaries (low ability to execute, high vision completeness), Blackberry and Accelion. We have four niche players (low execution ability and low vision completeness) – Intralinks by Synchronoss, then Thru, Ctera and HighQ. Compared to the 2016 quadrant, Microsoft and Google have both progressed from the challengers box into the leaders, with Syncplicity, now Axway, jumping up from the visionaries box. That box also used to contain Intralinks but it has fallen back into the niche players area. Ctera has entered that box, making its first mark on this MQ, while Varonis and Huddle have departed it and this MQ in its entirety.